Hypothyroidism is rare in cats, but unusual lethargy is a symptom. Very important things can come in small packages. The thyroid gland, while small, plays a vital role in your kitty's health. Nearly every tissue in your fabulous feline's body is affected by the thyroid hormone. When the thyroid hormone is out of balance, extra care is necessary for kitty. Hyperthyroidism generally affects kitties in middle-age and older. The thyroid gland becomes enlarged and begins producing too much thyroid hormone. If your kitty starts losing weight despite eating with gusto, it's a good idea to check him for hyperthyroidism. Restlessness, irritability and high activity levels in a middle-aged cat often are symptoms of an overactive thyroid. Your kitty's once shiny and soft coat may look greasy and matted. She may drink excessive amounts of water and urinate frequently. She may also suffer vomiting and diarrhea. Almost all the tissues in your kitty's body are directly affected by thyroid hormones. 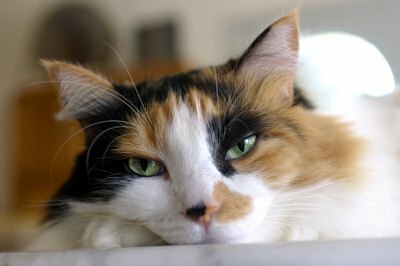 Hyperthyroidism can bring about related health problems in your pet. Her heart may beat faster and contract more strongly. The left ventricle of the heart may become enlarged, and the walls may thicken. Untreated, these problems can bring on heart failure. Luckily, treatment of the hyperthyroidism often will clear up the high blood pressure. When Kitty's thyroid gland produces too little of the thyroid hormone, the symptoms of low thyroid, called hypothyroidism, occur. If your normally playful and curious kitty plays less, sleeps more, gains weight, and seeks out warm places to nap, these may be signs of hypothyroidism. Your fabulous feline, who always in the past was meticulous about grooming, may suddenly look rather unkempt. Constipation and hair loss may occur. Hypothyroidism is rarely seen in felines, but sometimes is seen in cats who are on medication for hyperthyroidism or who have had thyroid surgery to correct hyperthyroidism. It also can be caused by iodine deficiency or cancer. Cats often lay low when they aren't feeling well. If you think something is amiss with your kitty and believe you may be seeing symptoms of thyroid issues, it's time to visit your veterinarian. Testing for thyroid issues will require a physical exam and blood tests. A complete urinalysis and biochemistry profile may also be necessary. Your vet will feel kitty's neck to determine if the thyroid is enlarged. Medication, thyroid surgery or radioactive-iodine therapy are treatment options for hyperthyroidism. Your kitty's age and physical condition, including the condition of his heart and kidneys, will be taken into account in deciding on a treatment option. Medication will require a life-long commitment. Surgery is more risky, but the hyperthyroidism is cleared up when it is successful. Radioactive-iodine therapy is a popular choice for treating hyperthyroidism. It takes one to two weeks to complete, but your kitty must be hospitalized, and visitors are not allowed. The success rate for the procedure is around 95 percent, with kitty's thyroid levels returned to normal or near normal. Hypothyroidism usually will clear up without treatment. If your kitty does need treatment, it will usually mean a lifelong commitment to giving her synthetic hormones. Her thyroid levels will have to be monitored by a veterinarian, who will adjust the dosage as needed. Does Thyroid Disease in Older Cats Starve Them to Death? What Drug Will Help the Thyroid in Cats?